Plans are underway to bring 33 new apartments plus restaurant space to the Plaza District. Local developer Ben Sellers plans to build 25 units plus commercial space on the vacant lot on the southwest corner of NW 16th & McKinley. The property is just to the east of the main commercial development in the Plaza District and is highly visible. The apartments would be a mixture of studios, 1-bed and 2-bed units, some with lofts. Parking would be interior to the streets with a drive tunnel through the commercial structure along 16th. Facing NW 16th will be a restaurant space and large patio with outdoor seating. Talks are underway with a potential operator which would be new to the OKC market. 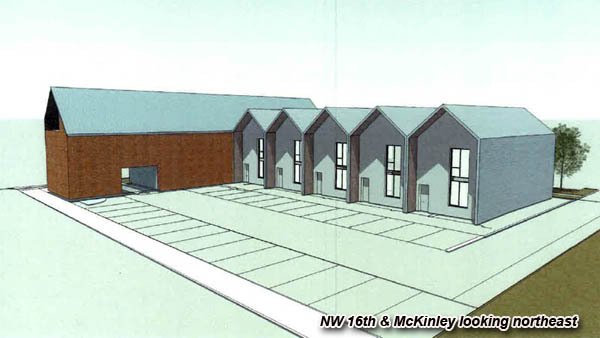 Sellers is also planning 8 apartments one block south, on the southeast corner of NW 15th & McKinley. The site was formerly a small convenience store that Sellers attempted to save but was discovered to be beyond repair. The 8-unit complex will feature 1- and 2-bed apartments; the 2nd level units will have lofts. The projects would represent the first new residential construction in the Plaza. The area continues to boom with the recent opening of Oak & Ore and Roxy's Ice Cream Social, which joined a wide variety of restaurants, bars and variety shops. Steve Mason is also in the process of renovating the Indiana Center and bring in new tenants to the space. Once zoning is approved, Sellers hopes to start on both projects simultaneously, taking about a year to complete. Gardner Architects is designing both projects. Sellers is a partner in the Tower Theater redevelopment project as well as the a renovation about to start at 916 NW 6th, and is also behind the rehab of 600 NW 23rd which features office space and Pizza 23 and Orange Leaf frozen yogurt in Uptown. Is this the reason the house was torn down on NW 16th early last week? Will the apartments have windows? Considering this is going into the Plaza, which is becoming famous for it's awesome retro-fitting and renovations, I gotta say I'm not a fan of such a bland new construction in the area. I feel like this is going to stick out in a weird way. That being said, these renderings look pretty rough, so I'll reserve my personal judgements until the project is more developed. I think the design is really sharp. The developer has spent tons of time meeting with people in the area, even though this project does not fall under any design review jurisdiction. This area is in desperate need of rental units and the new construction south of 16th will really help the Classen Ten Penn neighborhood. This could end up being awesome. I am waiting until I see a more detailed rendering before I form an opinion. I want to say that in other cities, some districts like the Plaza district have become a hybrid of funky, renovated old buildings like what is already there but also new construction. Midtown Memphis comes to mind and is what I see the Plaza district eventually becoming. 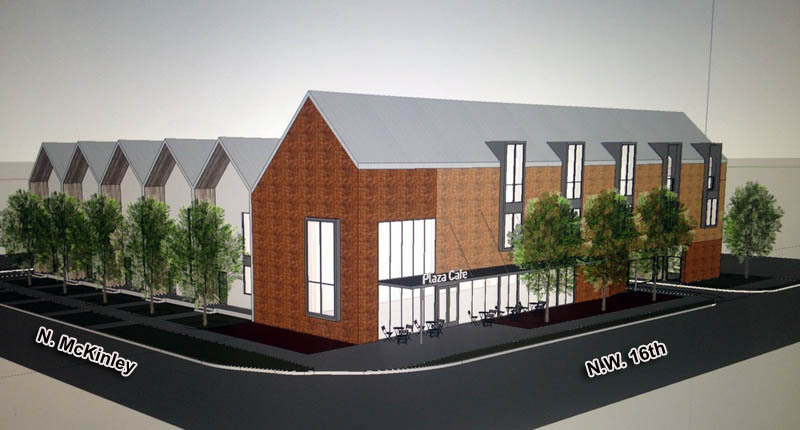 I'll reserve judgment till it's built but the renderings look like a bunch of barns. The color of the brick is going to be everything for the building. I'm with you 100%. These look like expensive horse stalls with pitched roofs. I'm also reminded of a slightly more deconstructed version of a CHK building, which appeals to my inner OSU sense. It's a modern interpretation of the big gabled homes in the surrounding neighborhoods. I think it's super sharp. Those look like houses from a cartoon or something. Kind of neat, but I don't think I'd want to live there. I do like the bluish green one on the far right. I want to live in that cartoon land then, those are all awesome. The one on the far right is actually my least favorite, go figure. I agree and think this will fit in well with the surrounding neighborhood. I took the below comments from the next door app. Enjoy! I really wanted to only send this to Gatewood and Classen Ten Penn, but it looks like it was Gatewood ONLY or the whole group of neighborhoods, but mostly I want to wave at the Gatewood and Classen Ten Penn neighborhoods. J'Anna posted the documents for this proposed development here at the Nextdoor site. They are in the documents section. This is the direct url https://tinyurl.com/qb7zufj . The development is high density for this area, and is allowing only ONE parking lot per apartment unit at NW 16 and McKinley. There is also 3,000 sq ft of commercial space, with NO parking allowed. 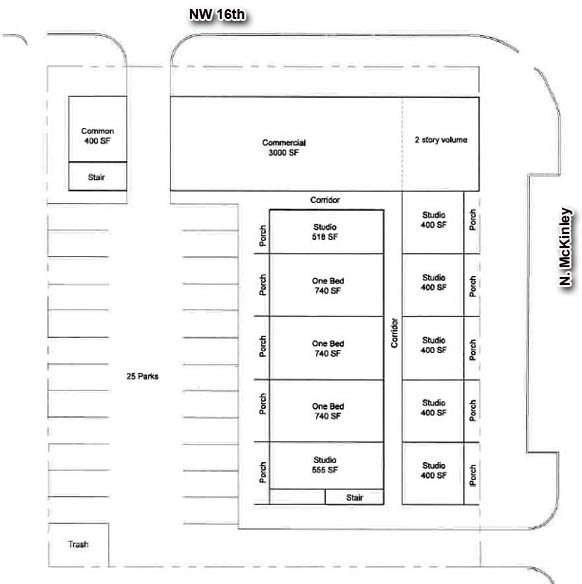 To allow only ONE parking space per unit for the NW 16th devlopment, and ZERO parking spaces for the commercial spaces guarantees that this development will be a constant trial and tribulation to its neighbors. This lot was originally a SINGLE family house, and it's destruction btw was a true loss to this community. This would work only if a clause were inserted into the rental agreements where each household would agree that they would only park one car at the development or in the neighborhood. No "one car on the street and one car in the parking space of the apartment complex." Also, they should probably be only allowed to have guests that walk or bicycle to the apartment. I am being facetious and hyperbolic here, of course, but this is bad urban planning. I hate parking lots, but they are a reality until we get better public transportation so that people can ditch their cars. Regarding commercial space. . . the plan doesn't say how many businesses will go in the 3,000 sq ft of commercial space. But why should the neighbors subsidize those businesses with the parking in front of their houses? If these businesses are going to stay in business, they will need customers! Here again, I could be facetious and say "allow them to only accept customers that walk or bicycle" but nobody would agree to that. Since no parking is allowed on NW 16th, the people who live along McKinley will lose the parking in front of their houses pretty much it seems to me. That apartment complex will fill up with people with 2 car households. The businesses will have auto traffic. It's a disaster in the making. Any ideas on how to oppose this? Is there someone we should send letters to besides of course Meg Salyer our council person? We are seeing this with almost every urban project now, where some neighbors are protesting due to increased density and some commercial use in proximity to existing housing. In a way, it's a good sign. Shows the City is finally starting to fill-in and that the neighborhoods care about what happens nearby. Thank you. This is a point I made recently about these micro-problems within a block, or two, or three. It's called civic engagement - and it's healthy! Social media let's them organize more than ever before. It makes it harder for the developers to 'increase value' without more people taking note. It also creates a situation where developers know they have to engage the surrounding community and businesses early on. As a City, it seems we struggled with these issues because the committees want to make everyone happy and that's never going to happen. But now, things seem to be working out relatively well, as the developers take it upon themselves to reach out and take input and if it just comes down to a few people being unreasonable in their opposition, the committee members seem to be able to move past that. I live in the neighborhood and have seen a decent amount of backlash against this online. It seems like a good development to me but I honestly don't have much expertise in the way of good urban planning. Are the concerns legit or is it typical NIMBY stuff? Am I missing something on the parking? 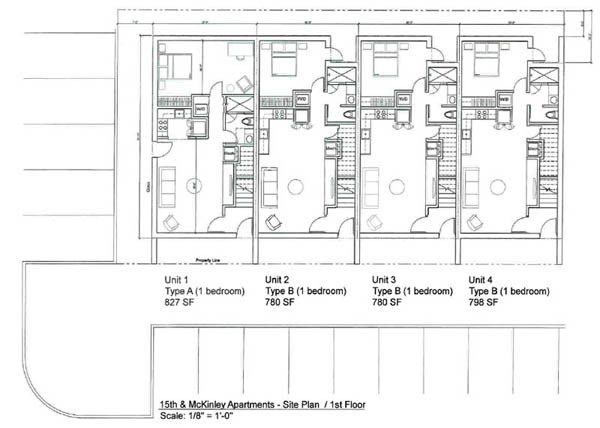 The plans above show 10 units and 25 spaces. The objection from gatewood talks about 1 spot per unit. The 16th & McKinley property has 25 units. This was approved today for 20 units. Does this have to go through anyone else for approval or are they cleared to start construction when ready? Just the zoning change which they received. No design review is required, so they should be getting busy quite soon. They'll have a waiting list for all the apartments and they are close on a deal for the restaurant space, so they will be cash flowing once they open the doors.